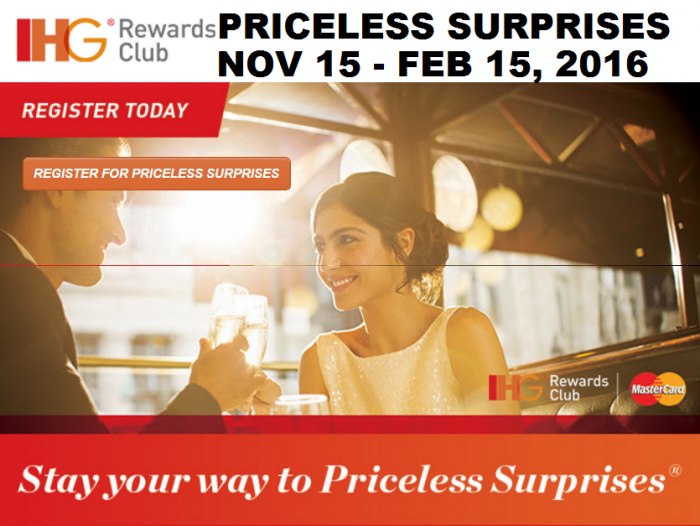 IHG Rewards Club has now enabled the promo registration for Priceless Surprises offer in conjunction with MasterCard. The promotion is valid for stays between November 15 – February 15, 2016, and open for IHG Rewards Club members with an account in the US. You can register for this promotion here. Beginning this week, IHG Rewards Club members who are U.S. residents can register for a new promotion called “Priceless Surprises” from IHG and MasterCard. Details follow. The promo dashboard shows that I would have registered for this offer back in 2012! I don’t believe that this is IHG’s promotion for the early next year. It is rather a promotion that they run with MasterCard. You will likely just earn 500 bonus points for your second and subsequent stays, although you have a small chance to win one of the greater prizes. Next articleWhine Wednesdays: SPG Chat Response Time Close To An Hour?